The best thing my Mum did was buying me a skateboard for my 9th birthday. For months after I poured a lot of my energy and time into skating. Through it I had experiences that have helped shape who I am today. It showed me the worth of resilience and how to follow through. If I could, I would buy every kid a skateboard. This compact cruiser is a really great size. At 28in long and 8in wide it provides a short but wide comfortable standing platform. The deck is made of a Maple – Bamboo mix and comes with a raw finish. It has a simple graphic on the top and bottom, utilising clear grip so it shows through. The deck has wheel flares to prevent wheelbite when you take tight turns and finally, a kicktail making it possible to do a few tricks and increase the maneuverability of the board. It has narrow 5in traditional kingpin trucks paired with 60mm tall, 45mm wide wheels. The narrow truck and small wheel combo will be easy to push, easy to turn, maneuverable and keep the setup lightweight – ideal features for a cruiser board suited towards kids. One drawback is the bearings, they do not roll smooth. However with a bit of a break in period this should be fine, if not they should be replaced. This is a great board given the price range and would make a good longboard for kids. On the costly side of things. We have a premium setup from the well established Landyachtz longboard. At just 28.5in long and 8in wide, this cruiser comes with double kicktails, 7 plys of maple and a unique graphic on the bottom. The deck has wheel flares and mild concave for comfort and a ‘locked in’ feeling. The setup consists of top of the line components. Everything – from the truck, wheels and bushings, have been engineered by the design team at Landyachtz to get the most performance out of them. The trucks are Bear Trucks and are 105mm (5in). These trucks are well known for being turny, stable and long-lasting. The wheels are 63mm/78a and 50mm wide Fatty Hawgs. They will easily roll over cracks and branches. One drawback is the cost, though you must understand that individually the parts would cost more. So with the given price, its a good deal. If its not within the budget, I suggest going for the White wave, its decent and wallet-friendly. Finally the last board we will look at. This classic board comes from the world renowned brand from Australia, Penny Skateboards. The Penny classic comes in at 22in long and 6in wide. This super compact deck is considered the standard mini-skateboard around the world. The deck is made from a top-secret plastic infusion and has a non-slip waffle top. Allowing you to skate without grip (though grip is available) and even barefoot if you want to. The standard wheels are 59mm, 83a custom Penny wheels. These wheels will be easy to push and will roll a bit fast. Inside the wheels are custom Penny abec 7 bearings. Not the best but do the job well enough. The board comes with very narrow 3in trucks. Altogether, this is a very portable tiny skateboard. I would highly recommend it for smaller children. Given its size, it would be hard for someone to comfortable learn on it. Though if your feet are small enough, then its perfect. If it is too small, take a look at the other boards mentioned, particularly the wider White Waves. 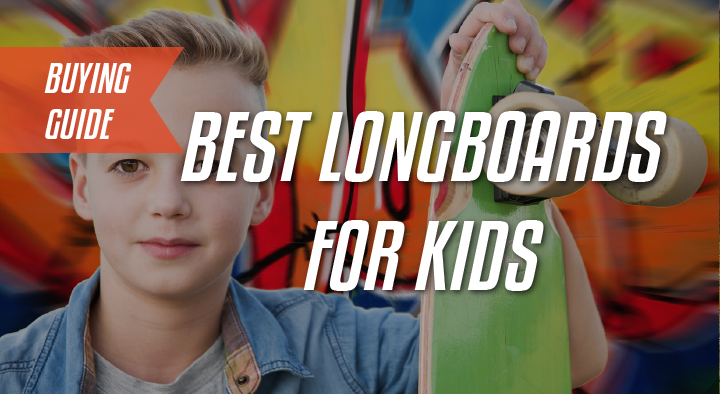 How To Get A Longboard for a Kid? An appropriate size – Longboards should be ridden according to your size (height/weight). The size affects your ability to turn and learn from edge to edge, push and typically dictates the weight of the board. You want to control your board, not the other way round. In my opinion, the best size would be a board under 30in in length. Given the average size of kids, the board will be stable enough but still be maneuverable. The width of the board (often disregarded, but important) A narrow board will be uncomfortable but a wide on will be easy on your feet. It will be easier to skate and balance on. Wheels size – you want small, skinny wheels. These will be easier to push and keep the board lightweight (another key feature) and easy to turn. What type of board do they want? Do they want something to do tricks on? Skateboards are better suited to that and those mentioned here are better for cruising. However, with a bit of effort, it is possible to learn tricks on a board like the White wave or Dinghy. Make sure your kid likes the board if they don’t then they won’t ride it. Along those lines, don’t be limited to only longboards for boys or girls, skateboarding is about self-expression. Let them pick the one they like. I cannot stress how important a safety gear is. Accidents happen in skateboarding so its important to be well prepared. With this mindset you can fall and fail within a margin of safety. My first recommendation would be a helmet. Head strikes can be particularly bad so this is the most important one, especially as you learn to skate. I recommend a set of kneepads and elbow pads. These areas stick out and usually get knocked when one falls. Keeping them covered will keep them safe and improve one’s overall skate experience. A skate tool will come in handy. It will allow you to adjust your trucks and otherwise maintain your board. In line with this, aftermarket bushings (the cushions in the trucks) will always improve ones setup. Getting one according to the riders weight will enhance how the board responds to rider input. They are nice but not necessary. I hope I have armed you with enough information to make a little shredder stoked on his setup. If you haven’t decided, I’d go with the Landyachtz Dinghy. It will be a great board for a kid. With the many color options available, you’ll find something you like. I really hope you buy a board, this purchase can really make a positive impact on a kids life. Sector 9 Dropper Review – A Freeride Machine? Heelsidechill.com is a participant of the Amazon Services LLC Associates Program, an affiliate advertising program – it is designed to provide an aid for the websites in earning an advertisement fee – by means of advertising and linking to Amazon.com products. Amazon and the Amazon logo are trademarks of Amazon.com, Inc. or its affiliates.